An official impact assessment for a controversial new Lao dam on the Mekong river has been directly copied and pasted in parts from a previous project, a coalition of groups fighting to protect the river has alleged. Save the Mekong alleged in statement that large sections of that study “are simply copied directly from the Pak Beng [report]” - a 2015 assessment for a different project that an MRC review found was inaccurate. “At least 90 percent of the Social Baseline Conditions section of the Pak Lay dam TBSEIA/CIA is copied directly from the Pak Beng dam assessment, including photos, tables and text,” the statement said. In one plagiarized section, the authors replaced the project name from the old report but forgot to adjust the correct listed developer, Save the Mekong said. “The Environmental Impacts and Mitigation section notes that after mitigation, all impacts from the Pak Lay dam will either be insignificant or positive. This section is not supported by evidence. Instead, it is copied from the Pak Beng assessment,” they further alleged. Under MRC regulations, Laos is obligated to submit transboundary impact studies as part of the prior consultation process with fellow member countries Thailand, Cambodia and Vietnam on any new Mekong dam project. The Save the Mekong groups are calling for the current study to be scrapped and the prior consultation process halted until a meaningful assessment is produced. When asked about the copied sections of the study, a representative of the Pak Lay dam developer Powerchina Resources Ltd who declined to be named denied they had been plagiarized from the Pak Beng report. “[The] Laos government have the exact knowledge for the process. We’re following almost the same process because the government of Laos have the sequence to make Pak Beng a little bit earlier than us but all of the documents are made by us independently,” he said. 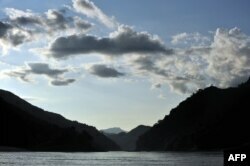 FILE - The sun sets over the Mekong river Oct., 16, 2009, near Pak Beng in northern Laos near the Thai border. No one raised the plagiarisms during sessions of the forum attended by VOA and Lao government officials flatly refused to discuss the matter. Anoulak Kittikhoun, spokesperson for MRC CEO Pham Tuan Phan, said he couldn’t say if the plagiarism identified would be assessed as a major problem or not. The Pak Lay project is almost 400 kilometers downstream from Pak Beng and about 190 kilometers directly overland. From a transboundary and cumulative impact perspective though, they are in a similar region of the more than 4,000 kilometer river. Maureen Harris, Southeast Asia program director of International Rivers, a member of the Save the Mekong coalition, said it was very misleading to imply that largely the same information could be used in a meaningful way to address the impacts of both projects. Laos began the prior consultation process with its neighbors on the Pak Lay dam the day after it said it was temporarily suspending all new hydropower proposals in reaction to the catastrophic July collapse of an auxiliary dam in the country’s south. Scores were killed and thousands displaced by the collapse of the Xe Pian Xe Namnoy Saddle Dam D, which the government eventually conceded was likely due to shoddy construction. It was the second dam collapse in Laos within a year. In April, the MRC Secretariat presented findings of a landmark 6-year, $4.7 million study that warned of catastrophic environmental impacts if hydropower development plans for the Mekong continued unaltered - especially from mainstream dams. Laos plans to build more than 140 dams on the Mekong and its tributaries, including five on the mainstream.